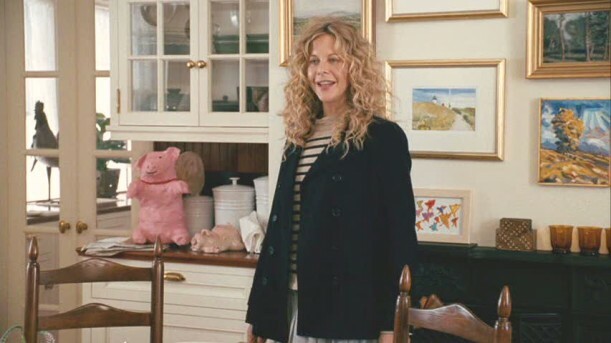 When I wrote about Meg Ryan’s traditional red-brick house from the 2008 remake of The Women, I asked whether any of you knew where it was located. Not only did a reader named Susan tell me that it’s in Dover, Massachusetts, but she sent me a link to the listing for it. That’s right–it’s for sale! And that means we get to peek inside and see what it really looks like. What’s more, there are lots of wonderful photos that prove what I suspected–that the movie was filmed inside the actual house, instead of on a separate soundstage. Wanna see? In the listing, you can see there is a stainless-steel backsplash behind the stove instead. The counters also look like they’ve been changed from green to black, don’t they? Check the listing for more information. To see more photos from the remake, as well as from the original 1938 version, you can read my original post here. Meg Ryan's Spanish-Style Bungalow in "Hanging Up"
.-= LoveFeast Table´s last blog ..Fancy Friday Lemon Zest =-. Love the acreage and the house! wow – gorgeous home – love that entry – divine! .-= Annie@A View on Design´s last blog ..St Kilda style by the beach =-. Wow! I love the actual house. One of my favorite rooms is the dining room with all that dark wood. 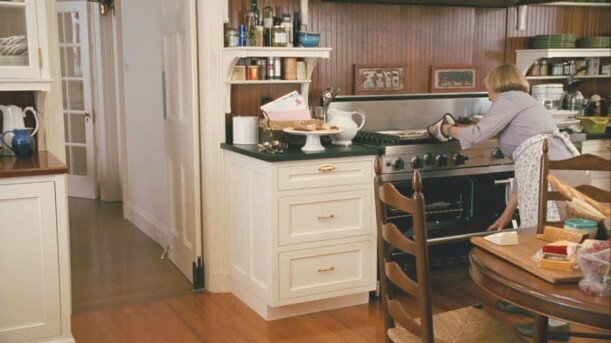 Just saw this movie for the first time a few days ago and noticed that I liked the kitchen. Much more than I liked the movie itself. Were we supposed to actually like any of those cartonish women? You could use this one to start a new series, Julia: “When bad movies happen to good houses”. .-= Tracy @ Comfort&Luxury´s last blog ..Daisy Fresh =-. Nice nice nice….good sleuthing as usual~! .-= linda@LimeintheCoconut´s last blog ..A cottage…a color…a collection… =-. I guess some people were meant to own these houses and some people (me) were born to read about them. Thanks for sharing! Great post! Loved seeing this house. The kitchen is so small compared to the size of the house and the size of the property, but I guess that is a sign of the times in which it was built – kitchens were tucked away and small. .-= Things That Inspire´s last blog ..Glass front cabinets – form over function? =-. .-= Nichole´s last blog ..My Car: The CD Graveyard =-. .-= le´s last blog ..Delights from the Holiday House =-. If only I were looking for a home in the $8 mil range! Beautiful and I’d negotiate to keep the furnishings. Anyone know what the annual upkeep on a house like this would be? I can’t imagine. Obviously if you can afford $8 million you don’t need to ask. .-= melissa´s last blog ..A to Z Me Me Me! =-. This is a fabulous post, as always! The house is so gorgeous, and I was intrigued by how much they kept in the movie. Who wouldn’t want to use this one–it’s perfect! I am behind, so now I need to go check out Meg’s house, and the houseboat from Sleepless in Seatle. .-= Misti England´s last blog ..Never Underestimate the Power of Paint =-. That place is lovely! Thanks for sharing it. I finally saw The Time Traveler’s Wife. Do you know anything about the house in that film? Holy cats is it gorgeous! I never saw that movie, but that is a lovely home! .-= Jenny´s last blog ..Links I Like: Edition 12 =-. It’s a beautiful home, but my goodness, what would you do with all those rooms? I want a long row of bookshelves in a small room like one of those last picts. .-= Trish @TheOldPostRoad´s last blog ..Table Lamps =-. This is such an elegant and timeless house. I do think the collection of pictures over the kitchen fireplace is a big improvement, but I just love the kitchen. I don’t think I would ever leave the sunroom–love that ottoman! Thanks for the tour! .-= Susan´s last blog ..Hooray for Hollywood….A Metamorphosis =-. ok, let’s see if this post sticks!!! Julia, This house is a little formal for our life style, however, we would learn to adapt …I would buy this house in a hot second…if we could afford it…stunning! .-= Black Eyed Susans Kitchen´s last blog ..YARD SALE SATURDAY AND ASBURY PARK SUNDAY = FUN WEEKEND =-. I love this post Julia, It gives for me the possibility of see the great differences in profesional lighting for the screen, that makes everything looks tottally diverse!!! Oh for pete’s sake, that house is real?! I think I was happier thinking it was a soundstage, now I’m completely green eyed jealous of whoever gets to live in this gorgeous space!! Although I think I would be happy if all I had was the sunroom with the bookshelves. I don’t think I would need the rest of the house, I’d spend all my time in there anyway. But I still want the rest of it! I think my favorite spot in this home is the sun room. Can you imagine reading all your favorite blogs with a cup of coffee every morning? I can! .-= desiree´s last blog ..Just Listed: Palo Alto Craftsman =-. .-= pattie and allie´s last blog ..Confirmation, The love of a friend, and Sunday Dinner =-. Never saw this movie either, but LOVE the house. Often these big places seem cold to me, not this one at all. Amazing. I like how in the movie they painted the hall heat vent to match the wall. Much better, IMO. Wow! This house is just gorgeous!! .-= Vicki´s last blog ..The parental stare =-. Gorgeous home…aren’t movie stars lucky…they get to be in all the best places. Sigh. .-= Amanda @ Serenity Now´s last blog ..My Totally Rad 80s Birthday Party =-. Wow, this is a beautiful house! It feels so cozy, even though it’s humongous. How fun to get to look all through it! Is it possible they have soapstone counters in the kitchen, which sometimes give off a green cast? .-= Kelli´s last blog ..I got the spring cleaning blues =-. I enjoyed this post so much. How can I get a job where I just go around looking for houses to make movies in? My Dream Job. Thanks again Julia. Wow! I’d LOVE to live in a house like this! In fact I’d just like to live in the book shelve lined sunroom! Just beautiful! Thank you for showing us it, Julia! .-= Pat´s last blog ..Brooklyn Celebrity Path =-. LOVE the sunroom! Ah – I want to sit there and read for days! .-= Jess @ Frugal with a Flourish´s last blog ..Mood Board Monday: Hip Nursery! =-. i like this house . Love the rooms. And looks homey..
.-= mishelle´s last blog ..I did it! I made an Mary Engelbreit inspired Chandy! =-. Hi Julia what a great post thanks…. I love the real entrance… I love all the rooms of the actual house better than the movie setting… WOW its a beautiful home… You got me … I am speechless… Regards Esther (one can only dream) from Sydney…. Gor.ge.ous! That wall of bookshelves and all those built-ins make my heart leap with joy. That kitchen! I am totally in love. Of course I prefer the beadboard version. I’m not a stainless steel girl. Fyi anyone , that stainless shows fingerprints like crazy. My Mom had it and it drove me nuts. I had to control myself from windexing constantly… Bead board is better in my book.. Thanks Julia. .-= pam @ becolorful´s last blog ..Inspired by Ballard Designs =-. I liked the Oriental rug under the master bedroom bed, and also the beautiful entryway! I LOVE looking at homes!!! I’m in love…. Thanks for sharing this fun listing! I’m in the movie business and would guess the stainless steel backsplash behind the stove was removed due to reflections (of lights and crew).